Estate planning is an important component of your overall financial health, whether your estate is large or small. Either way, you should designate someone to manage your assets and make health care and personal care decisions for you if you ever become unable to do so for yourself. All of your assets are to be included in your Estate. This could include assets held in your name alone or jointly with otheys, assets such as bank accounts, real estate, stocks and bonds, and furniture, cars and jewelry. Such assets would pass directly to the beneficiaries and would not be included in your will In addition, certain co-owned assets would pass directly to the surviving co-owner regardless of any instructions in your will. And assets that have been transferred to a revocable living trust would be distributed through the trust—not your will. Simpler procedures are available for transferring property to a spouse or for handling estates in which the total assets amount to less than $100,000. The probate process has advantages and disadvantages. The nature of your assets and how you hold title to those assets is a critical factor in the estate planning process. Before you take title (or change title) to an asset, you should understand the tax and other consequences of any proposed change. Your estate planning lawyer will be able to advise you. Community property with right of survivorship. If you are married or in a registered domestic partnership, you and your spouse or partner could also hold title to property as community property with right of survivorship. Then, if your spouse or domestic partner were to die, the property would pass to you without being affected by the deceased person’s will. If you are concerned that you may be unable to care for yourself, you can help determine what will happen by making your own arrangements in advance. Through estate planning, you can choose those who will care for you and your estate if you ever become unable to do so for yourself. Just make sure that your choices are documented in writing. 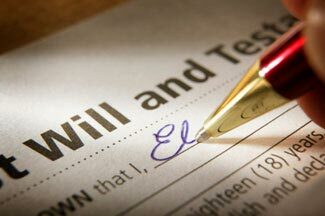 Source: California State Bar: Do I Need Estate Planning?